Paint-party is a social event that lets you try painting in a fun and casual ambiance, even if you have not painted since years! PAINTOLOGY-BY VINISHA brings to you a knife painting party/workshop which will not only de-stress your mind, but will help you create a beautiful painting even if you don’t know how to paint . We believe that ‘ART is THERAPY’, so come-relax and enjoy each stroke that you paint on the canvas with us. Don’t worry, NO PAINTING EXPERIENCE NEEDED. Amateur painters are welcome. 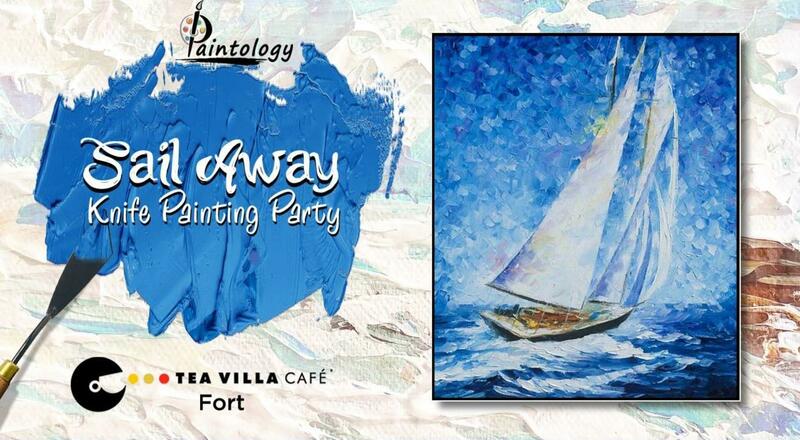 Join us for this paint party and take home a beautiful piece of art! This social painting makes art more accessible to everyone. Instructions are given step-by-step, which makes it easy for anyone to make a more-than-decent painting that’s ready to take home. Right from art supplies to setting up your easel, everything is taken care of. All you have to do it show up with an energetic mood. We will be painting this beautiful ‘Sail Away’ Scene with the help of a palette knife with acrylics on canvas. IMPORTANT NOTICE: INCASE OF HEAVY RAINFALL on the day of the event, please call Insider and confirm if the event is happening before bookings the tickets. If you book without confirmation, Paintology does not guarantee that the event will take place.